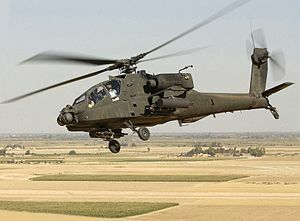 ↑ "Modernizing the Army's Rotary-Wing Aviation Fleet". Congressional Budget Office. नवम्बर 2007. ↑ "United States Department Of Defense Fiscal Year 2015 Budget Request Program Acquisition Cost By Weapon System" (pdf). Office Of The Under Secretary Of Defense (Comptroller)/ Chief Financial Officer. मार्च 2014. पृ॰ 18. ↑ अ आ इ ई उ ऊ ए ऐ ओ औ क ख ग "World Air Forces 2014" (PDF). Flightglobal Insight. 2014. अभिगमन तिथि 17 January 2014. 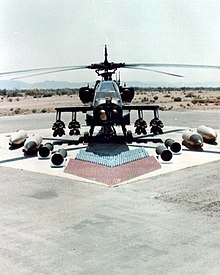 ↑ "Boeing AH-64 Apache". Jane's Information Group. 13 October 2000. मूल से 25 February 2008 को पुरालेखित. अभिगमन तिथि 1 April 2010. ↑ Donald 2004, pp. 134–135.